Apple is set to offer an industry-first with Etymotic's new personalised earphone program for iPod and iPhone. Now you really do have no excuse to not ditch those low quality earphones that were bundled with your MP3 player or iPod, because Etymotics and UK specialists Advanced Communication Solutions' customisation program really does give you the best quality in-ear listening you will have ever heard. 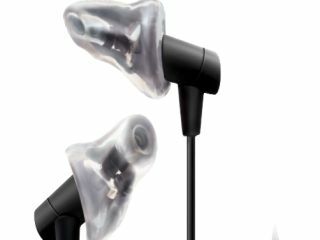 The TechRadar news team recently had the pleasure of having our ear canals moulded by ACS boss Andy Shiach, who, as an ex-musician, started the company originally to offer the service to fellow musos who required the best quality sound combined with comfort and – importantly – protection for their ear drums. "Adding custom earmoulds to high-fidelity earphones could compromise fidelity, but we found a partner in ACS that allows us to maintain the Etymotic sound signature while providing an extra level of customisation," said Mead Killion, president and founder of Etymotic Research. "All of our headsets and earphones are meticulously designed to deliver the most accurate, unaltered sound of any earphone or headset today. We constantly test our designs and those of the competition to ensure we maintain that position." And this is no mere sales guff, because we have tried and tested Etymotic's hf2 custom-fit headset and they are worth every penny of the £190 they are charging for them (£100 for the 'phones and £90 for the customised plugs from ACS). "People are listening to their iPhones and iPods more often and for longer periods of time," said Michael Shaver, Worldwide Director of Consumer Products Sales, adding "the hf2 custom-fit delivers the same level of comfort that performing musicians require during live performances." Etymotic Research's hf2 headset also features an integrated microphone for seamless voice calls. The hf2 custom-fit will be available starting April 28, 2009. Check out hearingprotection.co.uk for more.